Thank you for your interest in Harry Meyering. People who apply at our agency often have not worked in the field before, so we want to give you an idea of what to expect. The “buzz words” that probably best describe Harry Meyering are a residential setting serving adults with developmental disabilities. Residential means we work with in their homes, generally apartments or houses located in Mankato. For example, in one of our Intermediate Care Facilities, we have five apartments with three to eight people living in each apartment. Each person has their own bedroom, and share a common living room, bathroom and kitchen. Other people may live in other houses or apartments. Residential defines not only where people live but also what you might do on the job. Think about the things you do when you’re in your own home, not at work or school. Those are the kinds of things you could be doing while working at Harry Meyering, except that you will be doing them in the context of assisting and supporting the people who live there. You may assist in helping the individual get out of bed, get dressed, eat breakfast, brush teeth, take medications, cook a meal, clean a bathroom, wash clothes, rent a movie, go out to eat, make a phone call, take a bath or grocery shop. The activities you do each day will depend on whom you work with and their interests, as well as the day and time—getting ready for work in the morning vs. relaxing on a weekend afternoon. All people served by Harry Meyering have a diagnosis of developmental disability. All the people we serve need assistance and support in their environments—help in order to do the everyday things many take for granted. At that point though, any generalities we can make about the people we serve end. A few people may need only minimal assistance with areas like financial management, food preparation or social skills. Most people, however, need more assistance. That assistance can be anything from helping someone record a purchase in a checkbook to helping someone use the toilet, or helping someone sort their clothes or plan a meal. Many of the people we serve have no reading or writing skills. Some may have additional physical and/or medical problems. Some can walk, some can’t. Some can talk and carry on conversation, others have a very limited vocabulary and others may communicate with sign language, electronic equipment, gestures or facial expressions. Many are limited in their social skills and may not know how to act in various social settings. Some may get upset easily, and not always handle their anger appropriately. Working with people is a demanding job. You will be asked to do a wide variety of different tasks and the people you are serving may or may not want to do the task at hand. It takes time to develop a relationship with people. You may have to assist someone in very personal cares, like changing a disposal brief on an adult. Some people have difficulty expressing their needs and may strike out or yell at you in their frustration. You will be kept busy and may feel the pressures of “too much to do and not enough time”. You may be working in a situation where you’re all alone. Having said this, working at Harry Meyering is extremely rewarding. Having a wide variety of tasks means a more interesting job. You will have an opportunity to get to know people and to develop relationships that will become very meaningful to you. You’ll be able to see people grow and change, and you will see the impact you can make on other people’s lives. You will work as a member of the team. You will learn a lot from your co-workers, and you will learn even more from the people you serve. You will be amazed to find out how smart people who have developmental disabilities really are. You will do fun activities—games, concerts, restaurants, movies and more, all while getting paid. With this career, as with many careers, there will be many demands and pressures and sometimes unpleasant tasks to do. But there are also many rewards to the job and many exciting things to do. 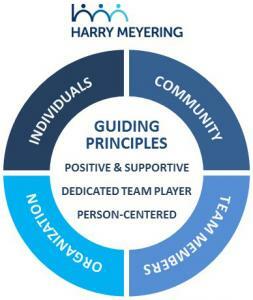 A big part of the Culture at Harry Meyering is living and breathing our values according to our Guiding Principles of being Person-Centered, Positive & Supportive, and being dedicated team players – all in the spirit of serving and supporting the individuals, the community, the organization, and each other. Sammy keeps this in her mind while supporting the individuals she works with “Don’t change them, let them change you.”. Rick’s favorite part of his day is coming home from work and reading the newspaper and watching television. Copyright © 2019 Harry Meyering. All Rights Reserved.